Discussion in 'Transmissions & Transfer Cases' started by RockRanger, July 8, 2011. I need to get a new cover for my rear axle. The one I have I think is warped cause I have never been able to get it to seal. That and when the ring gear bolts backed out they chewed the inside up pretty good. i like the solid covers look, however they are cast. ...As long as you are shopping you might want to pm this guy..He might be able to get you a deal.. Personally I would want a fill plug in whatever one I bought. Granted, you could tap a hole and add a plug if need be. My stock fill plug is seized, so I have to buy a cover with one, or fill it through the ABS sensor hole up top. The Riddler looks cool, what is it, cast? The Ruff Stuff one looks tough enough to survive your driving! I like the Riddler for the recessed bolts. The design looks like it will slide on obstacles without hanging up. I think most of the cast ones are 3/8" nodular which is pretty strong. random q, and i might not be in the right place for this. should i regear for moving from 255s to 265s? if so to just 3.73s? i ordered my tires in today and am hoping to have them installed by next friday. in the near future i will be doing SOA and 4" superlift, and 33s so should i just wait to regear to 4.10s when i get my 33s and just stay at the gear im on now? (Stocker?) I dont really know much about gearing and such. thanks in advance. Think I am going to give the Riddler cover a shot. Now to find the best price. Also Schobanger, you should have started a new thread but I would not regear till you get 33"s and I would go with 4.56 gears. I love my ruff stuff. Its took a hell of a beating. I originally ordered the Solid diff cover from Poly Performance but they were back ordered and upsold me on the Riddler one. My only two complaints are that it's a little trick to install (by yourself at least) due to being pretty smooth all around and the lack of fill plug. The latter being minor if your regular fill plug is not seized like some one said. Ive always ordered mine from Ruff Stuff so I lean towards them. But just be aware that sometimes it takes a while for the cover to arrive. I think I waited 3 wks for the last one to arrive and I had to actually call them to see whats up. So if you need it like within a week and you want to go with Ruff Stuff, I'd first call them and make sure the cover is in stock before placing the order. 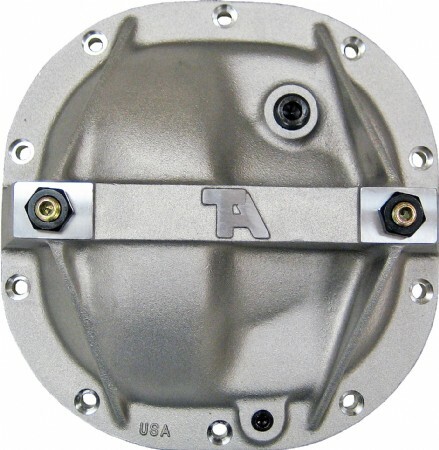 I'm still partial to the T/A diff cover because of the carrier cap preload bolts. Been running the same cover for 15 years or so with no problems and it's definitely been slammed around. Riddler! Yes it would be nice if it had a fill plug but it doesnt. The benefit of the lipless design makes up for it. That's the one i run on mine. Being aluminum concerned me enough that I built a little skidplate that runs down along the lower part of it, though it's good to know they still can be slammed around some. Just got a chance to check out the vid Turdle posted. Damn that Riddler cover is tough. though it's good to know they still can be slammed around some. I have yet to install mine (Riddler), but the build quality is really good and it looks slick.